WikiWorld contains a choice assortment of Di Filippo's best and most recent work. The title story, a radical envisioning of near-future sociopolitical modes, received accolades from both Cory Doctorow and Warren Ellis. 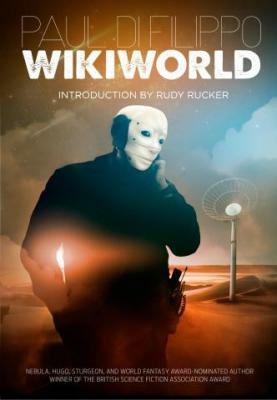 In addition, there are alternate history adventures such as "Yes We Have No Bananas" (which critic Gary Wolfe called "a new kind of science fiction"); homages to icons such as Stanislaw Lem ("The New Cyberiad"); collaborations with Rudy Rucker and Damien Broderick; and a posthuman odyssey ("Waves and Smart Magma"). Paul Di Filippo has been nominated for the Nebula, Hugo, Theodore Sturgeon and World Fantasy Awards and has won the British Science Fiction Association Award. He has sold two hundred plus stories, as well as several novels and novellas, such as the multi-award- nominated A Year in the Linear City. He was part of the first wave of both steampunk and biopunk, with influential volumes The Steampunk Trilogy and Ribofunk. He is also one of the preeminent critics and reviewers in the science fiction field, with his work appearing regularly in The Barnes & Noble Review and elsewhere. He lives in Providence, Rhode Island, with his partner of some 37 years, Deborah Newton, a world-renowned knitwear designer.